Margaret Bird will give an illustrated talk on ‘Keels and wherries in the 18th century‘ at Ludham Village Hall, on the Norfolk Broads, on Tuesday 7 October 2014 at 7.15 pm. More details are given below about this event, which is being hosted by the Norfolk Wherry Trust. The Norfolk trading wherry is one of the enduring and much-loved symbols of the Norfolk and Suffolk Broads. Only two are now sailing, Albion and Maud, both dating from the late 19th century. With their huge black sails and colourful paintwork these vessels can be seen for miles across Broadland’s flat landscape. At the banner for this page Albion appears to be sailing across fields when viewed from the path by Thurne churchyard. 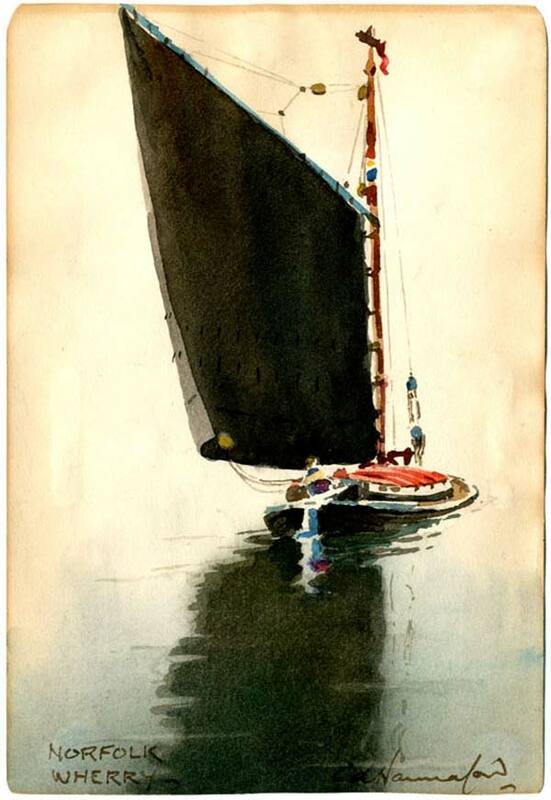 We learn a great deal about the early days of the wherry from Mary Hardy’s diary. 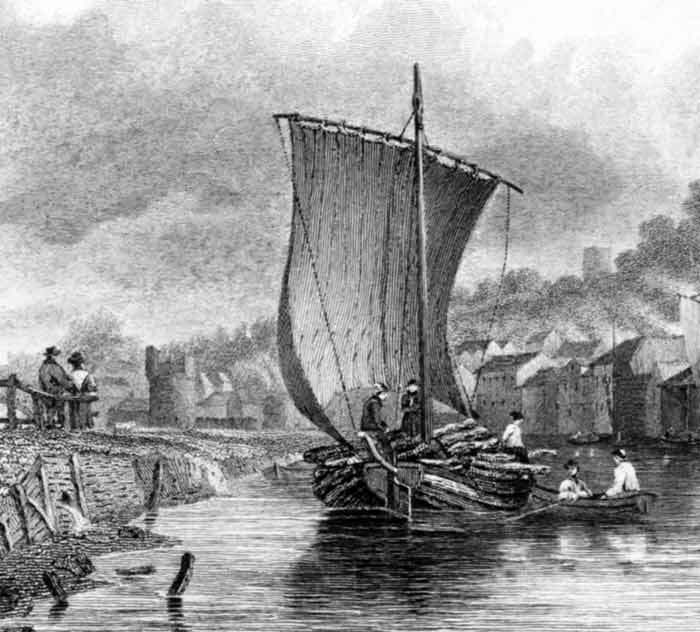 While at Coltishall in 1776 she and her husband William had a small wherry built in the village centre at Wright’s Yard, just upstream of today’s Rising Sun. They named her William and Mary. The diary entries enable us to compile something unique: an 18th-century wherry log. Mary Hardy tells of the cargoes, the dates of sailing and sometimes even the times of arrival and departure. Sailing often took place at night. The square-rigged keels have a longer history than the wherry. In the 18th century they were the workhorses of the waterways, generally carrying much larger loads than the wherries. They could easily be distinguished from the wherry. Their masts were stepped centrally, whereas the wherry’s mast is near the bow. The wherry skipper had a tiny two-berth cabin in the stern, right by the tiller, but the keel’s cabin or ‘cuddy’ was in the bow. By the end of the 18th century there were far more wherries than keels trading on the Broads. Taking vessels carrying 13 tons or more, there were 117 wherries as against 36 keels. However these figures are deceptive, as the tonnage figures show. The keel was generally able to carry more than the wherry, owing to the greater beam permitted by the square sail. 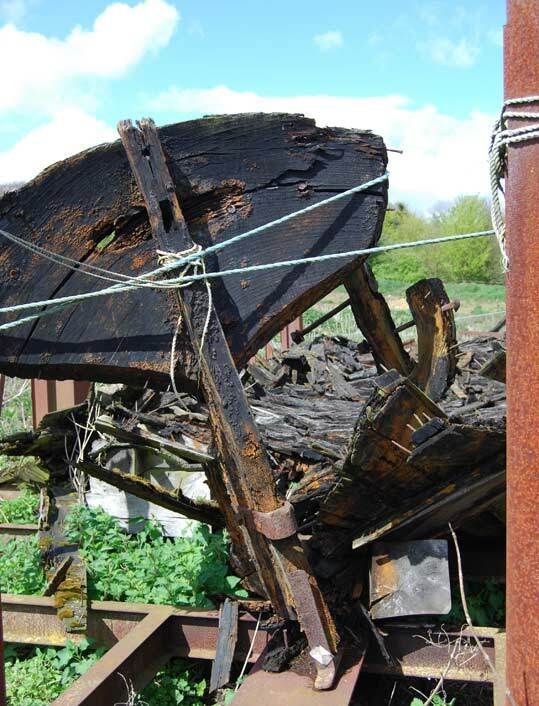 As a result the keel still had a vital part to play, especially on the wider waterways of the Yare and Wensum. By 1798 the wherries were carrying 3068 tons, the keels 2271 tons. The average individual wherry, carrying 26 tons, was far smaller than the average keel carrying 63 tons. Ludham Village Hall, Norwich Road, Ludham, NR29 5PB. The speaker Margaret Bird, editor of the Diary of Mary Hardy, has been a member of the Norfolk Wherry Trust since 1979. Ludham is a vibrant village on the Broads, with a fascinating history documented by its active community archive group.